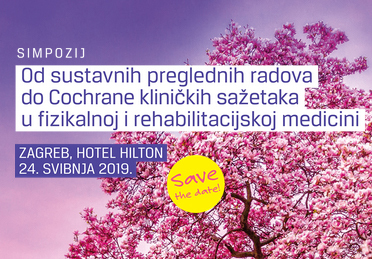 Fizikalna i rehabilitacijska medicina (Physical and Rehabilitation Medicine) is the official peer-reviewed journal of the Croatian Society of Physical and Rehabilitation Medicine, Croatian Medical Association. Its coverage of topics regarding the specialty of Physical and Rehabilitation Medicine also extends to interdisciplinary field of rehabilitation. 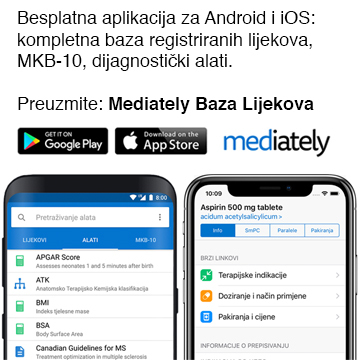 The journal publishes reviews and original articles, preliminary reports and case reports that report on important trends and developments in the field, and to inform professionals in Physical Medicine and Rehabilitation of developments that affect them in the clinical and nonclinical aspect of their practices. It brings readers relevant information on the therapeutic utilization of physical and pharmaceutical agents in providing comprehensive care for persons with disabilities and chronically ill individuals. 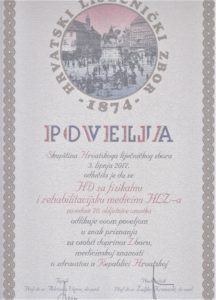 Periodically supplements with abstracts or full-texts presented at the congresses or symposia are published, too, as well as information regarding activities of the Croatian Society of Physical and Rehabilitation Medicine and its members in Croatia and abroad, as well as on activities of European Society of Physical and Rehabilitation Medicine and European Union of Medical Specialists PRM Section and Board. The journal is part of European PRM Journal Network initiative. All persons designated as authors should qualify for authorship. Each author should have participated sufficiently in the work to take public responsibility for appropriate portions of the content. All authors should take responsibility for the integrity of the whole work, from inception to published article. All others who contributed to the work who are not authors should be named in the Acknowledgments. Manuscripts should be accompanied by a covering letter signed by all authors including a statement that the manuscript has not been published or submitted for publishing elsewhere, a statement that the manuscript has been read and approved by all the authors, and a statement about any financial or other conflict of interest. A statement of copyright transfer to the journal must accompany the manuscript, too. Type or print out the manuscript on white bond paper ISO A4 (212 × 297 mm), with left margin of 35 mm, and right margin, top margin and bottom margin of 25 mm. Type or print on only one side of the paper. Use double spacing throughout, including the title page, abstract, text, acknowledgments, conflict of interest statement, references, individual tables, and legends. Number pages consecutively, beginning with the title page. Put the page number in the lower right-hand corner of each page. The text of the professional or scientific manuscript should be divided into sections: Title page, Abstract and Key words, Introduction, Methods, Results, Discussion, Acknowledgment, Conflict of interest statement, References, Tables, Legends and Figures. Scientific and Professional manuscripts, as well as Reviews should not be longer than 18 pages (including Tables and Figures). Case reports and Letters to the editor should not be longer than 10 pages (including Tables and Figures). The title page should carry: the title of the article (which should be concise but informative) and a short running title of the manuscript; full name of author(s), with academic degree(s) and institutional affiliation; the name and address of the author responsible for correspondence about the manuscript including his/her E-mail address. The second page should carry an abstract (of no more than 300 words). The abstract should state the purposes of the study or investigation, basic procedures, main findings, and the principal conclusions. It should emphasize new and important aspects of the study or observations. Below the abstract authors should provide 3 to 10 key words or short phrases that will assist indexers in cross-indexing the article and may be published with the abstract. Terms from the Medical Subject Headings (MeSH) list of Index Medicus should be used for key words. State the purpose of the article and summarize the rationale for the study or observation. Give only strictly relevant references and do not include data or conclusions from the work being reported. Describe selection and identify all important characteristics of the observational or experimental subjects or laboratory animals clearly. Specify carefully what the descriptors mean, and explain how the data were collected. Identify the methods, apparatus with the manufacturer’s name and address in parentheses, and procedures in sufficient detail to allow other workers to reproduce the results. Provide references to established methods and statistical methods used. Describe new or substantially modified methods, give reasons for using them, and evaluate their limitations. Identify precisely all drugs and chemicals used. Use only generic name of drugs. All measurements should be expressed in SI units. Papers dealing with experiments on human subjects should clearly indicate that the procedures followed were in accordance with the ethical standards of the institutional or regional responsible committee on human experimentation and with the Helsinki Declaration of 1975, as revised in 1983. Never use patients’ names especially in illustrative material. Papers dealing with experiments on animals should indicate that the institution`s or a national research council`s guide for the care and use of laboratory animals was followed. Describe statistical methods with enough detail to enable a knowledgeable reader with access to the original data to verify the reported results. Whenever possible, quantify findings and present them with appropriate indicators of measurement error or uncertainty. Specify any general-use computer programmes used. Present your results in logical sequence in the text, tables, and illustrations. Do not repeat in the text all the data in the tables or illustrations; emphasize or summarize only important observations. Type or print out each table with double spacing on a separate sheet of paper. Do not submit tables as photographs. Number tables consecutively in the order of their first citation in the text and supply a brief title for each. Give each column a short heading. Figures and illustrations should be professionally drawn and photographed. Make sure that letters, numbers, and symbols should be legible even when reduced in size for publication. Each figure should have a label pasted on its back indicating the number of the figure, author.s name, and top of the figure. Figures should be numbered. consecutively according to the order in which they have been first cited in the text. If photographs of people are used, either the subjects must not be identifiable or their pictures must be accompanied by written permission to use the photograph. All illustrations and figures could be submitted on compact disk in generally used picture formats. The preferred formats are JPEG and TIFF, although any format in general use that is not application-specific is acceptable. Make sure that minimum resolution should be 600 dpi. Use only standard abbreviations. The full term for which an abbreviation stands should precede its first use in the text unless it is a standard unit of measurement. Avoid using abbreviations in the Title of the article. List all contributors who do not meet the criteria for authorship, such as a person who provided technical help, writing assistance, or a department chair who provided general support. Financial and material support should also be acknowledged. Authors must indicate whether or not there is a financial relationship between them and the organization that sponsored the research. This note should be added in a separate section previous to the reference list. If no conflict exists, authors should state: The authors declare that there is no conflict of interest. References should be numbered consecutively in the order in which they are first mentioned in the text. Identify references in text, tables, and legends by Arabic numerals in the brackets. References should be cited in the style based on the formats used by the Index Medicus. The titles of journals should be abbreviated according to the style used in Index Medicus (http://www.nlm.nih.gov). References to papers accepted but not yet published should be designated as “in press”. Authors should obtain written permission to cite such papers as well as verification that they have been accepted for publication. All illustrations and figures could be submitted on compact disk in generally used picture formats. The preferred formats are JPEG and TIFF, although any format in general use that is not application-specific is acceptable. Make sure that minimum resolution should be 600 dpi. Up to two color illustrations are acceptable for each manuscript free of charge.